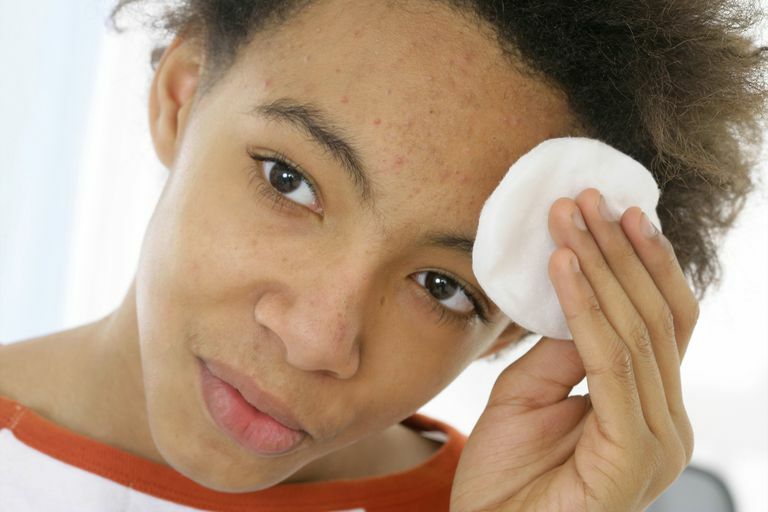 Mild acne is an annoyance for both teens and adults alike, and it's so incredibly common. But just because acne is mild doesn't mean it isn't aggravating. The great news is that mild acne usually responds well to treatment. With both over-the-counter and prescription options available, there's a treatment out there that can help improve your acne. You can often get mild acne under control by using products available at your local drug store. But acne treatment is a huge market—just walk into any skin-care aisle and you'll know what I mean. It's easy to become inundated, and overwhelmed, by the shear number of products available. If you know what ingredients to look for, choosing an effective treatment product becomes so much easier. Salicylic acid is a beta hydroxy acid that helps to cleanse debris from the pores. It's not the most powerful or effective treatment, but if you have slight problems with blackheads, blocked pores, and very mild breakouts, salicylic acid might work for you. Salicylic acid can help improve the effectiveness of other acne medications, though, so you might want to use it along with another acne treatment ingredient. This is the most valuable OTC acne ingredient we have today. Over-the-counter acne treatments can contain up to 10% benzoyl peroxide, but this is an example of when more doesn't necessarily mean better. Higher percentages cause more side effects, like dryness and peeling. Products with a lower percentage of benzoyl peroxide can be just as effective, but aren't as harsh. Start with a lower-percentage product first; you can always move up to a higher percentage if needed. Sulfur has been used as an acne treatment for decades. Today, you'll typically find sulfur treatment products such as masks, cleansers and spot treatments. Sulfur products work by drying the skin (and therefore drying out pimples). It's not the most effective over-the-counter treatment on its own, but it can be helpful when incorporated with other acne treatment ingredients. You can also use sulfur products along with other OTC acne treatments, as long as you aren't getting too dry. These aren't your standard acne treatments, and they probably won't clear acne on their own, but alpha hydroxy acids (AHAs) can help keep pores from becoming clogged in the first place. They can also increase the effectiveness of other acne treatment ingredients, so they're common additions to OTC acne treatment products. Of all the AHAs, glycolic acid is probably the most common (and the most helpful). AHAs exfoliate the skin, though they're often a more gentle way to exfoliate than scrubs. If over-the-counter products just aren't cutting it, there are plenty of prescription medications that can help clear up mild acne breakouts really quickly. Don't think your acne "isn't bad enough" to warrant a call to the dermatologist. You'll actually save money in the long run, because you won't be buying OTC products that just aren't working for you (not to mention you'll save yourself from some frustration, too). Some of the most popular prescription acne medications are topical retinoids. They're helpful in improving both inflamed breakouts and non-inflamed blackheads and bumps. Topical retinoids exfoliate the skin, help unclog pores, and make pores look smaller. They're also used as anti-agers (bonus)! Lots of acne medications work even better when used in combination with another medicine. That's the idea behind these prescription combo treatments: with one application, you get the benefit of two. So, you'll be getting benzoyl peroxide and adapalene, or tretinoin and clindamycin, in one medication. Professional treatments are another option for you. These procedures are typically done at a day spa or medi-spa. Treat these procedures as an addition to your regular acne treatment routine. You'll get the best results if you're using acne treatment products between your pro procedures. Facials are among the most popular of all the spa treatments. And, if done regularly by a skilled esthetician, they can help improve mild acne. During a facial, the esthetician will cleanse and exfoliate your skin. But the real value in the facial is to have your pores fully cleaned. Blackheads and other non-inflamed blemishes can be coaxed from the pores, which can help stop little blemishes from becoming big breakouts. Contrary to the name, these treatments don't really "peel" the skin; instead, they're another way to exfoliate it. An exfoliating agent is placed on the skin for a period of time and then removed. Afterwards, the skin is softer and ultra-exfoliated. Peels are usually done in a series of treatments and can help jump-start improvement of mild acne. Another popular salon treatment, microdermabrasion procedures help exfoliate the skin. A machine is used to apply crystals to the skin while simultaneously vacuuming them away (there are also crystal-less microderm treatments that use a diamond-tipped wand instead). Microdermabrasion is often incorporated into a facial treatment, usually as a series of treatments. You have a lot of treatment options, so you don't have to deal with mild acne. Let blackheads and breakouts be a thing of the past. Is Salicylic Acid the Right Treatment for Your Acne? Azelaic Acid: Is It Right for Your Acne? Why Do Pimples Come Back When You Stop Using Acne Treatments?